We have attempted to contact all clients that will need appointment shifting. If you currently have a Sunday or Monday appointment that hasn't yet been taken care of and you see this, please contact Alley as soon as possible at 757-644-6484 or red5tattoova@gmail.com. Thank you all for your cooperation at this time of transition. Many of our clients already know, as we've been getting a hold of some of you who had appointments on the days we're changing. We thank you for your continued support and patience as we transition to new hours. Martin Buechler will be with us from October 2 to October 5! His appointment slots are currently completely filled for his stay here. Martin Buechler is currently in the studio with us until the 28th. He is fully booked, but you can always stop by and bring him vegan snacks! 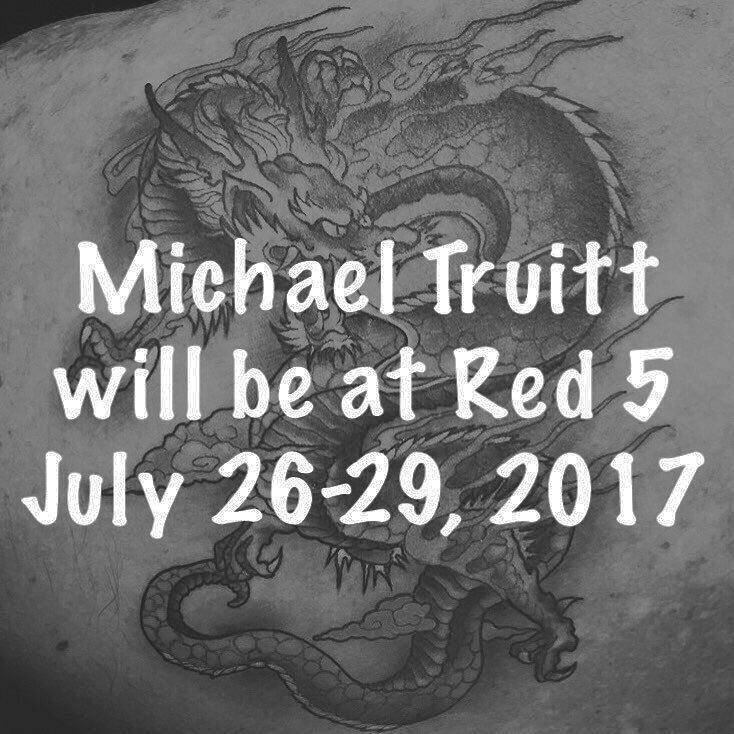 Michael Truitt will be with us the 25th through the 29th. He only has a few slots left last time we checked so get with him quick! Chris Garcia is out of the studio April 6-16, and will be back normal hours on Monday April 17. Rob Beresford will be out of the studio April 18-26, and will be back in April 27. Martin Buechler will be leaving the studio April 29th to head to Utah until May 22, and then leaving again to head back to Utah on June 18. We won't be taking anymore appointments for him at the moment. We are pleased to welcome Anthony Anderson to our crew! View him here. Red 5 is currently looking for a new artist to add to our group of talented tattooers. In addition, we are also hiring a new member to our front staff. Tattooer requirements include needing a valid Virginia DPOR Tattooers License, up to date CPR/First Aid and Bloodborne Pathogen certifications, a great attitude, and a professional tattoo portfolio. Front staff requirements include great customer service skills, being able to multitask, quick learner, and computer savviness. If you would like to be the newest addition to our team, please email us at red5tattoova@gmail.com. Tattooers please put ATTENTION CHRIS/CARL in the subject and send over your online portfolio and information. Front staff applicants please put ATTENTION ALLEY in the subject, and send over your resume and information. We look forward to meeting our newest members soon! Friday the 13th comes a few times a year generally, and we always get calls asking if we're running specials... the truth is that we don't plan for days like that, so our artists book appointments as they normally would. 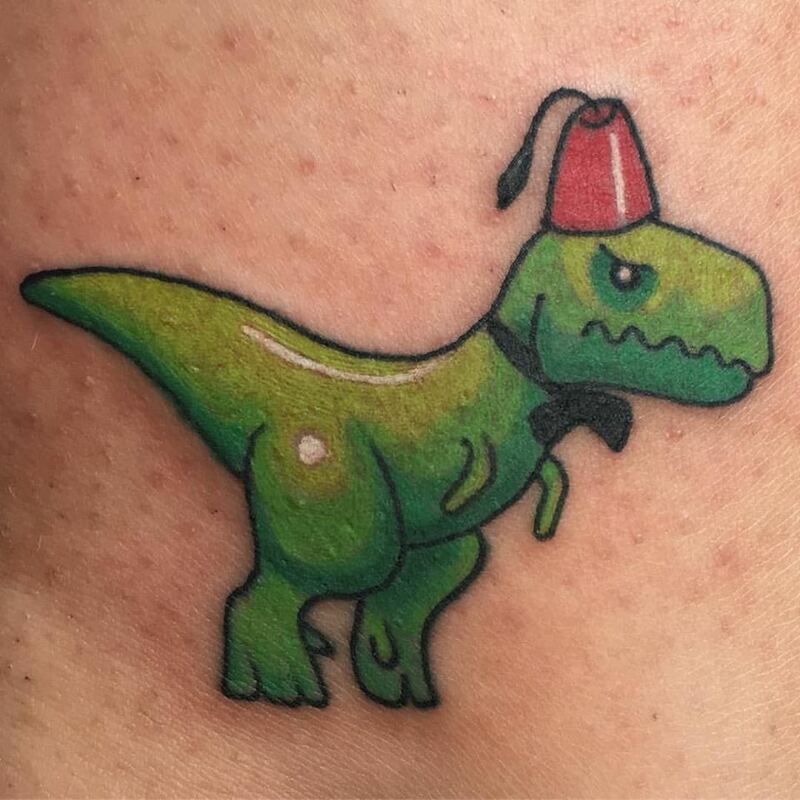 We aren't against Friday the 13th tattoos by any means, we just aren't in a position where we would ask our artists not to book appointments and to run a special instead. It's unfair to them and the clients who have waited for the appointments. With that, we hope you find someone who can help out! Tomorrows the day to get out and vote! If you're registered to vote, it's encouraged that you use your right at least once every four years more than it's pushed any other time. This years election has caused a lot of tension, but regardless there will still be a winner. We won't be posting our political views (they are all different, but we still get along) and we ask that no one imposes their view here either. What's important and using your voice in the manner you choose, regardless of what others tell you. Do your research, make your choices, and hope for the best. We're all in this together! Don't know where your polling place is? Click here to find out! Martin is auctioning off some his time to support a local dog rescue. Like K9 Justice League on facebook, and join the online auction!